Eliminate wireless dead spots and unleash comprehensive whole-home coverage on all your devices, all at once – the Whole Home Router 1000 is designed to handle large home networks. SmartBeam sends focused beams of bandwidth to individual wireless devices simultaneously, and delivers uninterrupted connectivity to any device, anywhere in your home. There’s a SharePort™ Plus for streaming USB devices and with 4 Gigabit Ethernet ports, you can connect your favorite entertainment devices as well, and give them up to 300 Mbps speed and advanced QoS bandwidth prioritization they need for seamless HD video streams, high-performance gaming, and VOIP calls without annoying glitches or lags. Build a wireless home network capable of delivering the bandwidth to handle HD video streams, large media file downloads, and online gaming to multiple devices, simultaneously. SmartBeam uses 6 multi-directional antennas to find and track individual devices , then focus beams of bandwidth to those devices, ensuring a seamless connection anywhere in the home. Ideal for large homes or small offices where concrete walls, successive floors in multi-storied buildings, or other architectural impediments can weaken a wireless signal, SmartBeam is designed to handle large home networks and can even power devices across large backyards. Eliminate wireless dead spots and unleash comprehensive whole-home coverage on all your devices, all at once – the Whole Home Router 1000 is provides uninterrupted connectivity to any device, anywhere in your home or small office. The Whole Home Router 1000 has not only been engineered to deliver seamless connectivity to your favorite wireless devices, but comes equipped with 4 high-performance Gigabit Ethernet ports to power your digital entertainment system as well. HDTVs, the Boxee Box by D-Link, Blu-Ray Players, xBox 360®, Playstation 3 –Connect your favorite performance devices and give them the 300 Mbps speed and advanced QoS bandwidth prioritization they need for seamless iPad® HD video streams, high-performance gaming, and VOIP calls without annoying glitches or lags. Connect Printers, NAS servers – even security cameras – Shareport Plus USB 2.0 lets you stream from any USB device. High-performance entertainment devices. Wireless signals anywhere in your home. Multiple laptops. Network storage systems. iPads, iPhones – It used to be that designing a home network capable of handling so many devices required some serious hardware and some seriously messy installation. Not with Amplifi™- the Whole Home Router 1000 has not only been engineered with the power to handle all of your digital demands, but with the smarts to put it at the tip of your fingers. Whole Home Routers offer Wireless G backwards compatibility. IPv6 allows for intelligent self-detect and router setup and with push-button connectivity and 128-bit security encryption standard, a secure home network is as simple as plug and play. The Whole Home Router 1000 protects your network with 128-bit AES data security encryption – the same technology used in E-commerce or online banking. Create your own network name and password or put it at the tip of your fingers with ‘Push Button Security’ standard on every Amplifi device. D-Link introduced its own by announcing its Amplifi family of high-performance home networking solutions. The company says the new products are designed to offer fast performance for even the most demanding connected homes. They include two routers (the HD Media Router 1000 with HD Fuel DIR-657 and the Whole Home Router 1000 DIR-645), a Wi-Fi Booster (DAP-1525) and three Powerline 500 products (DHP-500AV, DHP-501AV, and DHP-540). Though announced today, most of these products were first introduced during CES 2011 D-Link says that the HD Media Router 1000 with HD Fuel (DIR-657) is capable of automatically managing traffic flow and and prioritizing broadband connections for different services, such as media streaming, gaming, or voice over IP. The router boasts Gigabit Ethernet ports, USB SharePort Plus, and an SD card slot for accessing HD media and streaming USB devices. The Whole Home Products with SmartBeam, similarly, optimizes home wireless network bandwidth to handle HD video streams. D-Link claims that its SmartBeam uses six multidirectional antennas to find and track individual devices, then focuses beams of bandwidth to those devices, to ensure stable wireless connections. Both new routers are single-band (2.4Ghz) and supports 300Mbps wireless N standard. This is rather surprising, as most recent high-end routers feature true dual-band and/or the higher 450Mbps wireless standard. To make up for this, both of the new routers support IPv6 natively. The new Wi-Fi Booster (DAP-1525), on the other hand, does support dual-band (selectable 2.4Ghz and 5Ghz). It’s essentially a wireless bridge, similar to the D-Link’s previous version, the DAP-1513, and is designed to extend an existing router’s wireless signal to up to four Ethernet-ready devices. The new device features Gigabit Ethernet, SharePort Plus, Wi-Fi Protected Setup, and IPv6 support. If the new routers seem a little behind the time due to the lack of support for true dual-band, D-Link’s new Powerline products are all features the latest 500Mbps speed (as opposed to the 200Mbps of the HomePlug AV standard). The three new products include a single adapter (DHP-500AV), a kit that include two adapters (DHP-501AV), and a PowerLine AV 500 four-port Gigabit Switch (DHP-540). Apart from that, they share the same function of turning a home’s electrical wiring into a network, extending the existing network to the far corner of the home. Apart from the DIR-645 that will be available in August (at the estimated price of around $120), the rest of the products are available now. The HD Media router DIR-657 is slated to cost $150, the Wi-Fi Booster (DAP-1525) is $160 and the three Powerline products, DHP-500AV adapter, DHP-501AV Starter Kit and DHP-540 Four-Port Gigabit Switch have the price tags of $100, $160, and $200, respectively. FOUNTAIN VALLEY, Calif., Sept. 14, 2011 /PRNewswire via COMTEX/ — D-Link today announced the latest products to join its Amplifi(TM) family of high-performance home networking solutions, the HD Media Router 2000 (DIR-827) and the PowerLine AV 500 Gigabit Switch Kit (DHP-541). Designed to optimize a home’s Wi-Fi signal and provide increased and continuous Internet strength, the HD Media Router 2000 offers advanced wireless connectivity and HD Fuel® for automatic bandwidth prioritization, enabling seamless high-quality HD streaming, gaming without lag time and uninterrupted VoIP calling. The PowerLine AV 500 Gigabit Switch Kit delivers additional bandwidth through existing electrical wiring and outlets, enabling consumers to connect an entertainment system to the network from any room in the house with speeds of up to 500Mbps. Featuring data transfer rates of up to 600Mbps and HD Fuel®, the HD Media Router 2000 offers simultaneous N600 Dual Band (300Mbps + 300Mbps) for streaming HD videos and surfing the web at the same time. HD Fuel enables the built-in Quality of Service (QoS) engine to automatically prioritize high bandwidth activities for uninterrupted HD video streaming, gaming and VoIP calling. Unlike conventional routers, it is specifically designed to automatically provide extra bandwidth to certain activities, enhancing online entertainment and eliminating glitches or lags. The high-performance HD Media Router 2000 also allows users to stream online media content to multiple devices anywhere in the home, for the ultimate online entertainment experience. In addition, the new home network router features USB SharePort(TM) Plus with a USB 3.0 port for sharing virtually any USB-enabled device, such as a printer or storage device, across the home network at faster transfer rates. It also includes an SD Card slot for sharing media files with anyone on the home network, whether it’s a photo or movie file. The PowerLine AV 500 Gigabit Switch Kit (DHP-541) features D-Link’s PowerLine AV 500 four-port Gigabit Switch (DHP-540) and one PowerLine AV 500 Adapter (DHP-502AV) for simple, secure, fast connectivity to hard-to-reach places in the home, such as a basement or attic. Using a home’s existing electrical wiring, consumers can easily plug, play and transform any conventional power outlet into a fully-functioning Ethernet port. Ideal for home entertainment systems, PowerLine technology allows consumers to connect to the network from any room in the house with a fast 500Mbps transfer rate. And with the ability to support multiple streams of HD content and prioritize Internet traffic with a built-in QoS engine, these PowerLine HomePlug AV products deliver glitch-free movies, gaming, web surfing, and downloading simultaneously. For more information and detailed specs on the HD Media Router 2000 (DIR-827), the PowerLine AV 500 Gigabit Switch Kit (DHP-541) or other D-Link Amplifi products, visit amplifi.dlink.com. The HD Media Router 2000 will be available in late-September with a retail price of $149.99 throughout D-Link’s network of U.S. e-tail and retail outlets, including Fry’s and Micro Center, and at the company’s online store ( www.dlinkshop.com ). The PowerLine AV 500 Gigabit Switch Kit will be available for a retail price of $159.99 in October. Awhile ago, Cisco refreshed its E series of routers and switches. Today, D-Link introduced its own by announcing its Amplifi family of high-performance home networking solutions. D-Link says that the HD Media Router 1000 with HD Fuel (DIR-657) is capable of automatically managing traffic flow and and prioritizing broadband connections for different services, such as media streaming, gaming, or voice over IP. The router boasts Gigabit Ethernet ports, USB SharePort Plus, and an SD card slot for accessing HD media and streaming USB devices. 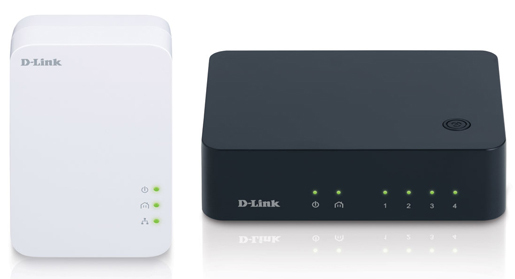 Apart from the D-Link DIR-645 that will be available in August (at the estimated price of around $120), the rest of the products are available now. The HD Media router DIR-657 is slated to cost $150, the Wi-Fi Booster (DAP-1525) is $160 and the three Powerline products, DHP-500AV adapter, DHP-501AV Starter Kit and DHP-540 Four-Port Gigabit Switch have the price tags of $100, $160, and $200, respectively.